Update April 2, 2019: with the shutdown of consumer Google+, Google+ custom URLs will no longer work. This will not affect YouTube custom URLs. Update April 5, 2017: you can now remove Custom URLs, and add a new different Custom URL. Learn how to change your Google+ Custom URL. Go to www.youtube.com/features to see if your YouTube channel is eligible for a Custom URL. 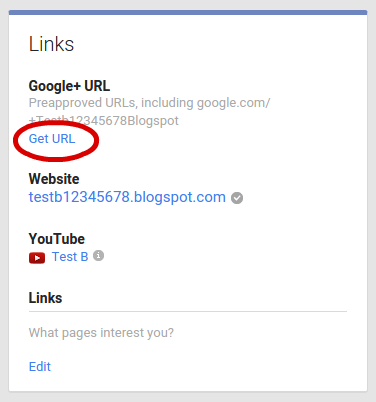 Learn how to add a Custom URL to your Google+ Profile or Page. Update 10/13/15: now only 100 subscribers are required for custom URL eligibility, rather than 500 subscribers. If you have recently created a new YouTube channel, you are sure to have noticed the default channel URL includes a long string of characters that are hard to remember and tricky to type. A custom URL makes it easy to share and promote your channel. At the end of November 2014 YouTube introduced a new custom URL process. New custom URLs now apply to both your YouTube channel and the Google+ Page or Google+ Profile connected to your your channel. That means one unified identity and URL across Google products. And if your channel already has an old-style YouTube username URL, this is an opportunity to add a new custom URL that better reflects your channel’s current identity. Google offers one or more custom URLs based on a number of factors including your Google+ name, YouTube channel name, current YouTube /user/ URL, and associated website domain. It is not possible to request a particular custom URL. After claiming an offered custom URL, it immediately applies to both your YouTube channel and Google+. 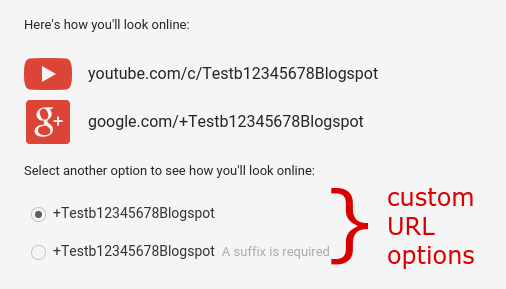 If your Google+ Page or Profile already has a custom URL, then that URL already applies to your YouTube channel connected to that Google+ identity. Check your channel's Advanced Account Settings (https://www.youtube.com/account_advanced). What are the eligibility requirements for a custom URL? How do I find the Custom URL offer? How do I claim the custom URL? What can I do if I don’t like the offered custom URL or need to add a suffix? How can I change the custom URL once it's set (capitalization, diacritics and accents)? If I add a new custom URL will the old custom URL for my YouTube channel still work? Why doesn’t my new YouTube channel custom URL display in the address bar? Why does the old shorthand vanity URL for my channel now direct to a different channel? Why hasn't my YouTube channel or Google+ Page been offered a custom URL?! Either your YouTube channel or the Google+ Page or Profile it's connected to can qualify for a custom URL. Once the custom URL is set it applies to both YouTube and Google+. Check your channel's Advanced Account Settings (https://www.youtube.com/account_advanced) to see if your channel already has a custom URL. Learn more in the YouTube help center. If your channel does not meet those requirements, it is often easier to make the Google+ Profile or Google+ Page connected to your channel eligible instead. My channel is eligible, how do I find the Custom URL offer? It is not possible to request a custom URL. Instead, once your YouTube channel or your Google+ Profile or Page connected to your channel becomes eligible for a custom URL, you will be offered one or more URLs that you can claim. You should receive an email notification from YouTube or Google+ when a custom URL is ready for you to claim. However, in my experience, the email notification seems to sometimes go missing. 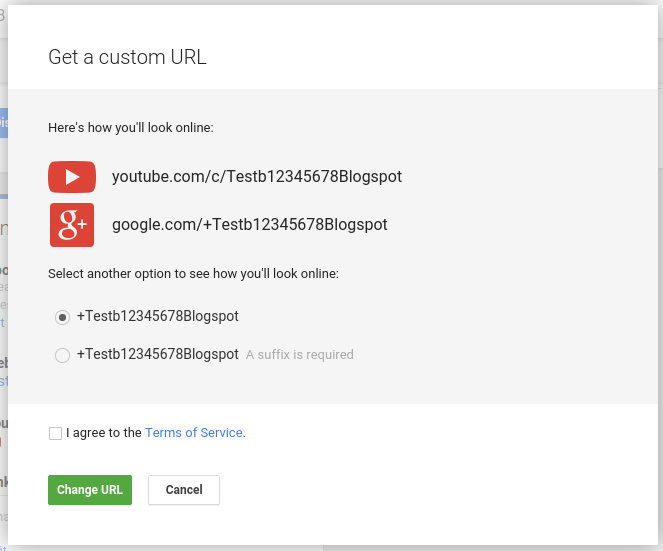 If you are sure your YouTube channel or Google+ Page is eligible for a custom URL, you can check for offers directly. 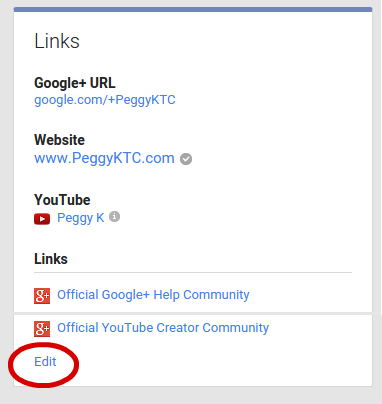 Note that if your YouTube channel is connected to a Google+ Page, you must be signed in as the manager of that Google+ Page to see the offered custom URL(s). How do I claim the offered custom URL for my YouTube channel and Google+? 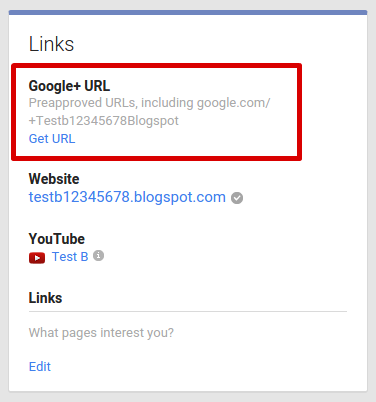 Using a desktop computer, you can claim your URL from the link in the notification email, the notification in YouTube channel’s Creator Studio or Notifications, or from the “Links” section on the About tab your Google+ Profile or Google+ Page. Note: once you have claimed the custom URL it cannot be changed! Don’t claim a custom URL unless it’s one you are happy with! What if I don’t like the offered custom URL? or I’m required to add a suffix? One of the drawbacks of the current custom URL process is that you cannot select the custom URL yourself. Instead you can only choose from what Google offers you. You may need to add extra characters to the offered URL. A green check mark will show if the URL is available. But what if I don't want the offered URL? If you do not like the offered custom URL, or do not want to add a required suffix, don’t claim it. Once the custom URL is set it cannot be changed. If you are offered a custom URL that requires a suffix, you may later be offered the URL without having to add extra characters, if that is available. Keep an eye on the Links box on your Google+ About tab, because you may not be notified of new custom URL offers. Google+ and YouTube have not shared any details about how the offered custom URLs are selected, so this is based on observing what URLs Google+ Pages, Profiles and YouTube channels are offered. Changing the name or associated website sometimes may result in the offer of a different custom URL (but is not guaranteed to trigger a new offer). > Google+ Brand Pages are usually offered a custom URL based on the domain of the associated website. When the domain is not a .com, Google may include the top level domain (for example .net, .org) in the offered URL . > Google+ Local Pages may be offered a URL that includes the business name and location, especially if the business has multiple location. You can also send feedback to Google+ and YouTube if you were not offered the custom URL you were expecting. You are not likely to get a direct response from Google and it may not result in the offer of a new custom URL, but Google does read feedback and take it into consideration when deciding what options to offer in the future. 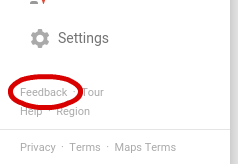 Send feedback to Google+ from your profile's "About" tab using the Feedback link at the bottom of the left navigation menu. Can I change the custom URL for my YouTube channel? Change capitalization, accents or diacritics. You cannot change the new YouTube custom URL once it’s set for your YouTube channel and your Google+ Page or Profile. The one thing you can change is the capitalization, accents or diacritics of the letters in your new custom URL. 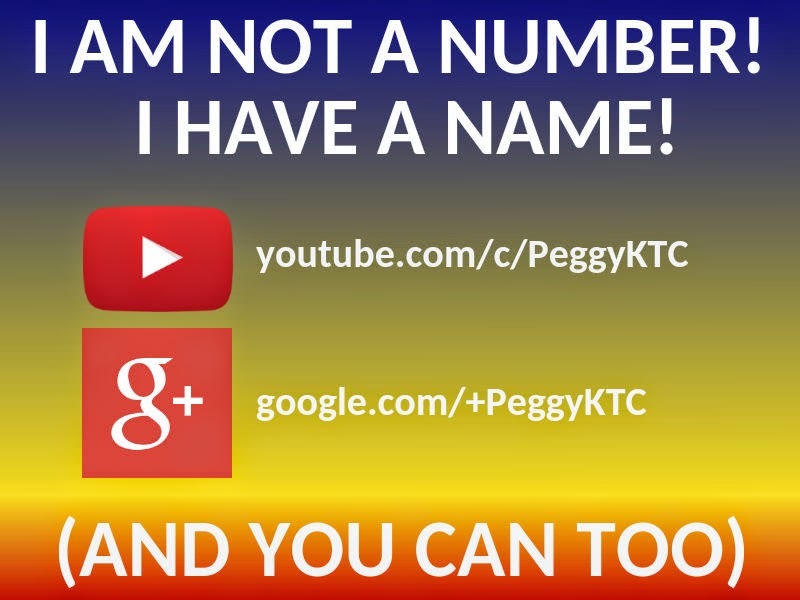 When I claimed +peggyktc , I changed it to display +PeggyKTC and I could change it to +PéggŷKŦC (all three of those lead to my Google+ Page). Click the About tab at the top of your Google+ profile. Edit the capitalization, accents or diacritics of your custom URL. If I add a new custom URL to my YouTube channel will the old custom URL still work? Your old "user" custom URL will continue to work after adding the new custom URL. This means a YouTube channel may have multiple URLs. Note the new custom URLs must include the /c/ in the URL. As of February 25th, shorthand vanity URLs (such as www.youtube.com/PeggyKTC) are now based on the new-style /c/ custom URL of the channel, not the old /user/ custom URL. Old shorthand vanity URLs based on the /user/ custom URL appear to still work, as long as no other channel has claimed the equivalent /c/ custom URL. Learn more about the new shorthand custom URLs. Why doesn't my new YouTube channel custom URL display in the address bar? When you check your YouTube channel, you may not see the new custom URL. Currently when you navigate around a YouTube channel, the channel URL that displays in your web browser’s address bar will be either the /channel/ Channel ID URL, or the old /user/ username URL. This hopefully will eventually change so that the new custom URL displays instead. Why hasn't my YouTube channel been offered a custom URL?! does your channel meet all of the eligibility requirements? Your channel won’t be offered a custom URL until after it’s eligible. Check your channel's Advanced Account Settings (https://www.youtube.com/account_advanced) to see if your channel already has a custom URL. does the Google+ Page or Profile connected to your channel already have a custom URL? If your Google+ has a custom URL, the connected YouTube channel already has a new custom URL and won’t be offered another one. did your channel only recently became eligible for a custom URL? You need to wait for a custom URL offer. Custom URLs are not necessarily offered immediately when a channel (or Google+ Profile or Page) becomes eligible. If you have questions about adding a custom URL to your YouTube channel, you can ask in the YouTube Help Forum. If you have questions about adding a custom URL to your Google+ Page or Google+ Profile, post a question in the Google+ Help Community. 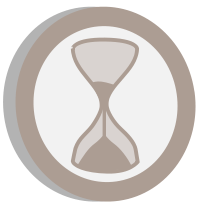 Thanks to +Jaana Nyström and +Masatake Wasa for comments and suggestions. Few years ago, I had a YT channel "user/Ryoker". I messed something with it, and then I deleted it and created other. Somehow, I wasn't able to have the "user/Ryoker" url for my new channel, even though the old didn't exist anymore. So I created "user/RyokerI", long time ago. I'm the owner of "Ryoker.com" and it's already associated on my YT account, as I use Analytics, AdWords and such. Last, I just set up my google URL to be "/+Ryoker". I have 60 subs on YT. Is there a way for me to to get the "youtube.com/Ryoker"? I have changed my google G+ URL months ago. But In my youtube channel linked with this G+ profile Youtube is still offering me a old Custom Url . But i wish to be offered a new custom URL based on my new google plus URL. Hi S_h_a_r_k_93: YouTube hasn't provided details about what they look at exactly. However, just from observation, I think that it can be a problem if your channel's name uses multiple alphabets (like latin/english and arabic, for example) or - maybe more relevant - characters that are not letters or numbers. So if your display name has underscores, that maybe is part of the reason. That assumes you channel is otherwise eligible, with at least 100 subscribers, at least 30 days old, with profile photo and cover art and in good standing.